Christmas came a little earlier than expected this year for skateboarders, rollerbladers and bikers here. The skatepark they have been asking base officials to build for more than a year recently opened for business. 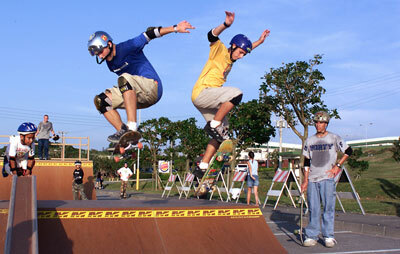 Just as skating has gained popularity in the United States, U.S. service and family members stationed on Okinawa who enjoy the sport have also been lobbying for a place to call their own. The new Extreme Skatepark was officially dedicated during a ceremony at Roberts Field here with a crowd of more than 100 anxious rollerbladers, skateboarders, bikers and parents. Skaters here have received the new park with a great deal of enthusiasm. "I love it, I don't think they understand how much we appreciate this," said Jason Roe, a two-and-a-half year veteran of skating and 10th-grader at Kubasaki High School. The Extreme Skatepark has been a major issue here since parents and skaters first mentioned their interest at a town hall meeting last year. Illegal skating in the streets and skating in the fire lanes around the housing towers fueled the issue. "We have a large population of children on Kinser," said Cindy McGarvie, community services coordinator, Camp Kinser Marine Corps Community Services. "The community came together to present a brief to Col. Puckett at the town hall meeting." According to Josh Kiser, an eighth-grader at Lester Middle School and skateboarder for one year, he and his friends attended all the town hall meetings and wore shirts reading "legalize skateboards" to promote and voice their view of the future skatepark. With feedback from the community, the skatepark initiative was started in August 1999. After months of planning and research, two 40-foot containers arrived from Boulder, Colo., with all the makings of a skatepark. In just a few days after offloading all the pieces, elements of the park were bolted together and the Extreme Skatepark took shape. Soon after, crowds gathered while installers changed the flat, bare parking lot into a ramp island of peaks and valleys. "This is my favorite part of what we do, seeing the kids swarming around with excitement waiting for the job to be finished," said Matt Demers, a sales representative with the manufacturer of the ramps for the skatepark. Emotions grew from anticipation to excitement once all the pieces were put in place. A myriad of obstacles dotted the once bare parking lot. The completed task of a six-foot half-pipe, three-foot quarter-pipe, a fun box with launch ramps, grind rails, spine ramps, and a 25-foot wedge awaited the opening ceremony's skaters and BMXers. "Most people think that it's all high school-aged kids skating," said Demers. "The reality is most of the kids are from 5 to 10. We want to get the kids involved to give them a sense of ownership, and I'm happy that the military saw and filled the need for the skaters." The park is already scheduled to see future improvement in the next few months by adding a 10-foot fence around the perimeter.